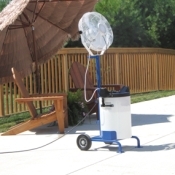 The VersaMist Portable Misting Fan System with Cart is the perfect solution for any outdoor activities to keep everyone cool. 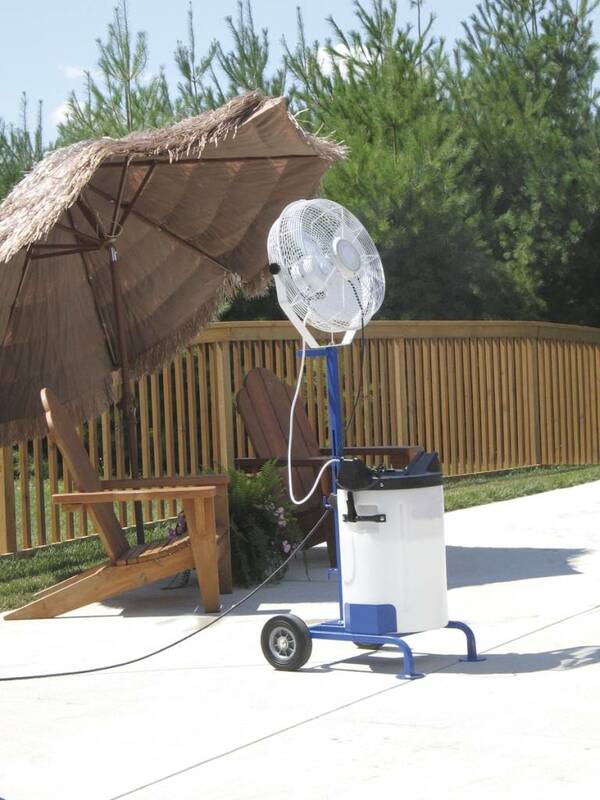 This portable misting system has a 3-speed motor , a 10 gallon water reservoir so you can use it almost anywhere; pools, construction sites, camping, picnics, on the patio, or at the game. It has a 25 foot outdoor rated power cord with integrated GFCI. The pump is rated at 1 gallon per minute output housed in a heavy duty enclosure with a power cut off tip switch, as well as the cart for easy mobility. The fan assembly includes a white powder coated fan mounted to a yoke that is attached to the pump enclosure. The patented hub increases the air flow from the fan and releases mist in the "sweet spot" of the fans air stream. The mist hub has four .012 nozzles. One extra nozzle and two plugs are also included. Designed for sporting, commercial, and industrial use. Ideal Cooling and Misting Applications: Rental , Outdoor Retail , Fire Departments/Rescue Squads , Pools , Patios and Decks, Construction and Job Sites ,Sporting Events, Tent Rental, Camping/Resorts. Includes 25' outdoor-rated power cord with integrated GFCI with power cut-off tip switch.